... the church will be present on earth during the tribulation and that they will act upon God's warnings. 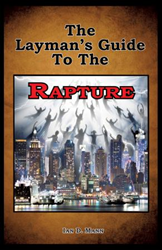 Ian Mann’s new book, The Layman's Guide To The Rapture, ($15.49, paperback, 9781498473835) describes that a time of great tribulation is coming as prophesied by Jesus. He explains that the pre-tribulation rapture is not a "blessed hope" but rather a dangerous deception that will cause many Christians to be unprepared and suffer needlessly. The book shares four distinct views on the Rapture and answers numerous important questions on the minds of Christians – many of whom have avoided the Rapture topic out of fear. This book does not contain any secret or unrevealed truths and there are no special revelations given only to the author. He simply reveals the plainly spoken and universally acknowledged teachings of Jesus and His disciples. He also looks at the timeless principles of God shown to everyone throughout the Old and New Testaments. That’s why he named this book, “The Layman’s Guide.” Readers do not have to be a Bible scholar to understand anything in the book, and they can follow along in whatever version of the Bible they prefer. Ian Mann brings a life of servitude to the Lord and a love of the truth to writing this book. He believes that every Christian has his or her own "hotline" to God through the Holy Spirit. He explains that the Bible warns everyone that there will be many false prophets in the last days. Ian encourages that it is time to rely on the Word of God only and to stay in prayer until they receive a definitive answer from God. Xulon Press, a division of Salem Media Group, is the world’s largest Christian self-publisher, with more than 15,000 titles published to date. Retailers may order The Layman's Guide To The Rapture through Ingram Book Company and/or Spring Arbor Book Distributors. The book is available online through xulonpress.com/bookstore, amazon.com, and barnesandnoble.com.